Jane Springer is a Certified Life, Wellness and Style Coach. She began her wardrobe consulting business in 2012 and has been coaching women since 2014. Jane’s dream is to help women to feel as beautiful as God knows they are. Through one-on-one coaching, presentations and retreats, Jane help women get unstuck and move forward in their relationships, work, health and their God-given purpose. She is an active volunteer for her church, and she relishes her role as wife, mom, step-mom and grandmother to 10-year-old twins. IF YOU HAVE EVER FELT INDECISIVE ABOUT YOUR DREAM, THIS WAS THE EPISODE FOR YOU. In this week’s episode, Jane reminds us that God often uses the difficulties and challenges He has allowed in our lives to serve as inspiration for our dreams. In her case, it was her own health struggles that led to her desire to help other women with theirs. She teaches us the importance of learning to pay attention to what’s going on inside of you as you consider a direction for your dream. She also offers an example and a challenge on the importance of being true to who God created us to be—our authentic self. Jane demonstrates courage in sharing her dream because she’s willing to talk about it even though it’s not yet perfect. She has wrestled with indecision along the way, which hasn’t been without consequence. I appreciate the realness with which she shares those struggles and reminds us that struggle is often part of the process of dreaming. In hearing her story, you’ll discover the value of trusting God’s timing and the importance of waiting on Him to show you what’s next instead of stepping out because you’ve grown impatient with the wait. Help me reach my goal of five new patrons by the end of the year. 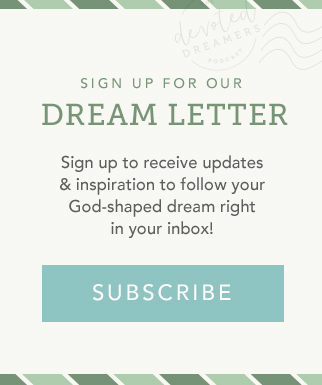 Your support helps me continue providing content each week to support listeners, just like you, in taking that next step toward their God-shaped dreams! who lives in you and was given to you by God? become a dwelling in which God lives by his Spirit.